From 23 – 25th of November CARI and four other GIZ programmes participated at the third Agra Innovate West Africa, the region's leading crop production, processing and manufacturing tradeshow in Lagos.CARI exhibited trainings material, parboiling vessels and its partners’ produce to a highly interested audience.To promote their products two CARI partners joined the trade fair; Michael Okunoye from ONYX Bida Rice Mills Ltd. and Stephanie Okpere from eHealth Nigeria. As the local rice expert Michael answered questions regarding production areas and methods, rice varieties, processing facilities and distribution channels. Stefanie on the other hand represented the diversification component of the CARI project, promoting the orange flesh sweet potato, which is highly nutritious and Vitamin A rich. The most frequently question to the CARI team and its partners was “Where can I buy it?”, showing the great interest and demand for the products. About 20 million people in Nigeria get their main source of income from subsistence/ commercial farming. Many of these people have no or limited access to finance. The resulting gap between the supply and demand of agricultural finance is estimated at a minimum of USD $4billion per annum. The African Competitive Rice Initiative (CARI) and Green Innovation Centre for the Agriculture and Food Sector (GIAE) engage in enhancing the access to finance for small-holder famers by cooperating with private and public banks to increase awareness of the sector’s needs and the opportunities agricultural lending offers. For this purpose two trainings for Agricultural Value Chain Financing for bankers were organized in Lagos and Abuja. The main objectives are to improve the understanding of management principles of agriculture as a business with a focus on primary producers, their characteristics, objectives and the management of production factors along the production cycle. The training also covers value chain financing/services and business models for sustainable and commercially viable agricultural enterprises. 43 representatives from various private commercial and microfinance banks as well as from public banks and from the Federal Ministry of Agriculture and Rural Development participated. The overall feedback was very positive and CARI received numerous requests for further trainings. The next training is planned for January 2017. In order to improve the policy framework for rice sector development in the CARI countries the John A. Kufuor Foundation (JAK) supports private sector led advocacy platforms to prepare policy papers. The policy papers were developed with joint participation of relevant stakeholders of the private sector in the context of a comprehensive study. The study determined the most important policy requirements in the rice sector. As a result a total of 12 thematic papers were developed and shared with the relevant government agencies in the respective countries. The full versions of the policy papers can be downloaded below. The CARI 2016 national workshop was organized by Kilimo Trust to provide CARI partners as well as stakeholders of the rice value chain to share their valuable experiences. Throughout the one day workshop key challenges were addressed as well as way forwards to generate further investments in the rice sector in Tanzania. Follow the link for the full workshop report including lessons learnt and presentations on mechanization, rice markets and consumer preferences, rice processing and policy. CARI in collaboration with Green innovation Centers has conducted a 2nd training on contract farming for rice millers in Nigeria. With the growing demand for locally produced paddy for quality milled rice, CARI has identified the need for millers to build and strengthen contract farming and out grower relationships with local paddy producers / small holder farmers. This ensures adequate quality as well as continuous supply of paddy for a sustainable rice value chain in Nigeria. The training was targeted to managers of rice mills and other actors in rice value chain. The aim was to build capacities around contract farming skills. The training focused on; introduction of contract farming as an inclusive business model, initiating, planning, implementing and monitoring a successful contract farming scheme, and an overview of the Nigeria Commodity Exchange. The participants expressed their satisfaction for the knowledge acquired by supporting their interest with an individual action plan for implementing the lessons learnt from the contract farming scheme. GIZ is looking for an ADVISOR ON RICE VALUE CHAIN DEVELOPMENT for the Competitive African Rice Initiative (CARI) in Nigeria. Une importante rencontre des acteurs de la filière riz s’est ouverte le mercredi 9 novembre 2016, à Ouagadougou sous la présidence du représentant du ministre de l’agriculture et des aménagements hydrauliques, Moussa Maïga. CALL FOR TENDER COMPETITIVE AFRICAN RICE INITIATIVE (CARI) The competitive African Rice Initiative wishes to announce its call for tender for the conduction of a yield survey for the wet season 2016 in Ghana and Nigeria. CARI intends to engage a Consultant/Consulting firm/Research Institution/Other Organization to conduct a yield survey in CARI’s area of implementation in Ghana and Nigeria. CARI is looking for one institution per country to implement the study. The objectives of this assignment include: 1. To obtain representative yield data of smallholder rice farmers in CARI’s area of implementation in Nigeria and Ghana by conducting crop cutting experiments 2. To assess the agricultural techniques applied by smallholder rice farmers and 3. To compare agricultural practices of smallholder farmers in different production bands (i.e. compare agricultural techniques of farmers at different productivity levels). The Competitive African Rice Initiative (CARI) collaborated with Better Rice Initiative Asia (BRIA) to organize a study visit programme on Rice Value Chain in Thailand, on 14-20 February 2016, for project partners from West Africa (WA) to directly learn from stakeholders in the Thai rice value chain, what it takes to be a leader in the global rice industry. BRIA is a sister project of ASEAN Sustainable Agrifood system. Participating in this visit were 14 professionals selected from Burkina Faso, Ghana, Tanzania and Nigeria, who represent a range of professions from producers, service providers, to workers for government extension and advocacy organizations. They have good knowledge about rice supply chains in their country. Please follow the link for the full report on the exchange visit to Thailand. CARI, represented by the John A. Kufuor Foundation and the CEO of Kilimo Trust, participated at the Grow Africa Investment Forum, a side event of the World Economic Forum held in Kigali. The grow Africa Forum took place on the 10th and the 11th of May, 2016. CARI presented a case study to support a regional advocacy platform for the rice value chain. 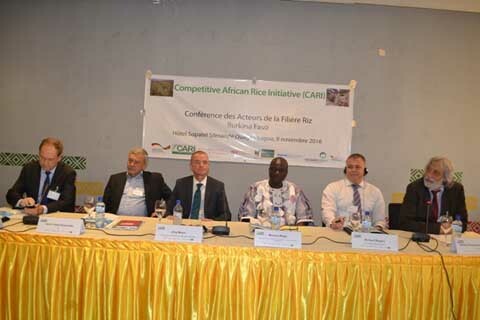 CARI together with Grow Africa, Africa Rice and the European Centre for Development Policy Management has agreed to establish this platform to better address advocacy topics related to trade and tariffs.